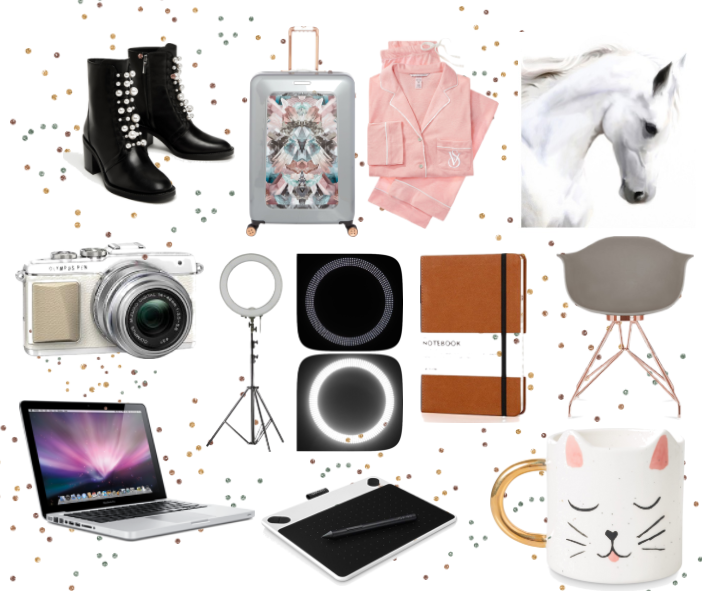 Now that we've come to the end of the gift guides and are most definitely within touching distance of Christmas day, I thought I'd share my personal Christmas wishlist with you all. For me Christmas is about family time, making people happy and eating a delicious dinner... The presents are just an added bonus and I have only asked for a couple of things this year, as saving is our priority right now (and Elodie's list to Santa was HUGE). So view this list as a bit of fun, I don't expect it all, or even half, but in a dream scenario, these are the items I'd be finding under my tree on Christmas morning. Zara Pearl Boots - As soon as I set eyes on these boots on Instagram, I knew they had to be mine... That was until I saw the price tag, and cried a little! That's when I decided to pop them on my Christmas list instead. If I am lucky enough to receive them, they'll feel like even more of a treat, as they're not something I could really justify buying for myself. Ted Baker Suitcase - For years I have wanted a fancy suitcase and I think I've finally found one I really love. It might be a little excessive to spend a huge amount of money on a case when I only use them a couple of times a year, but I know it would be something I could really look after and keep for years and years... It would also make recognising my luggage much easier on the racks of the train each time I go to London! Victoria's Secret Pyjamas - I've wanted a pair of these for so long now. I love VS and always visit the stores when I'm in London, but despite treating myself to the underwear now and again, I've never bought the PJ's. I'd love to be able to put on any of the pink or pink and white striped pyjamas this Christmas eve, ready for waking up in on Christmas morning. Prints - I have so many walls in my house just crying out for some prints, so to receive a few this Christmas would be a really great gift. I can't tell you how many hours I spend browsing prints online, but I can never decide on which to buy. To have some bought for me would make the decision much easier! Olympus Pen Lenses - I have had my Olympus Pen for around 18 months now, and I love it so much, but definitely need to expand on my lens collection slightly. I've done quite a lot of reading and research about all of the different lens options available, and I'm really hoping for the 45mm lens (I'd love the 75mm lens too, but it's so much more pricey!) I'm all about improving my photos and photography style next year, and I think a new lens will be the perfect starting point. Ring Light - Keeping with the photography theme, I really want, and really need a ring light. This Winter has been SO dark, and I've struggled so much with my photography. Loads of bloggers and YouTubers talk about how great ring lights are, and I think it's about time I added one to my equipment stash... Here's to brighter photos in 2018! Bullet Journal - Having used a Bullet Journal throughout the majority of 2017, I definitely want another for 2018. I've loved creating pages in my journal, experimenting with ideas and always having a place to write things down and tick things off... Now that I've done my first, I have lots of ideas for how I can improve my bujo, and how I can get more out of it next year. I might start blogging about it more too. Office Chair - Another need for me is an office chair, as I don't currently own one, and it would be nice to be able to sit comfortably at my desk rather than perched on a stool from time to time. I know an expensive, posh chair isn't really a necessity, but it's a little luxury that I would love to add to my office... I haven't decided on an exact style that I love, but anything along the chrome, copper, grey colour scheme would work great for me. Laptop - You may or may not know (if you follow me on Twitter, I'm guessing you've seen me moaning about it at some point), but my laptop broke in the Summer, and I've been unable to replace it. As a blogger, I don't need to tell you how much this has made working difficult and I don't just want a new one, I actually neeeeed one! Wacom Intuos Tablet - As I'm wanting to get back into YouTube next year, I'd love to receive a tablet which allows me to create fancy fonts and extra design options for my thumbnails and photos. After a lot of reading and chatting to other bloggers, I've come to the conclusion that this is a pretty affordable but really good option. Oliver Bonas Mug - Last but not least, I've been lusting after this incredibly cute cat mug ever since I spotted it on Hannah's Instagram. I don't need it, but you can never have too many mugs can you really?! I'd just have to decide whether to use it for my hot chocolates or keep it on my desk looking pretty! The Zara boots are amazing!!! !